The U.S. XI that defeated Mexico on May 24, 1934. While the last time the U.S. faced an opponent in a one-off playoff match was the 3-0 loss to Canada on December 22, 1976 at Estadío Sylvio Cator in Port-au-Prince in Haiti, the first time was against Mexico to qualify for the 1934 World Cup. The management of the 1934 U.S. World Cup team was distinctly Philadelphian. Team manager Elmer Schroeder, who also happened to be the president of the U.S.F.A., had been born in the city and played soccer at the University of Pennsylvania when Penn was the national collegiate champion in 1919 and 1920. After managing the U.S. team at the 1928 Olympics, Schroeder managed the Philadelphia German Americans team that won the National Amateur Cup in 1933 and 1934. He chose as the 1934 U.S. World Cup team’s coach David Gould, the Scottish immigrant who settled in Philadelphia decades before and played on the John A. Manz team that won the American Cup in 1897. Gould later was an assistant coach at the University of Pennsylvania when Schroeder was a student there. The team’s trainer, Raymond Gadsby, was also from Philadelphia. The 1934 U.S. World Cup squad was selected through a series of three tryout matches, with the first and third matches taking place in Philadelphia. In the first match on May 2, 1934, the U.S. team beat the Pennsylvania League All-Stars, 8-0. Two days later in Newark, New Jersey, the U.S. side lost 4-0 to an A.S.L. 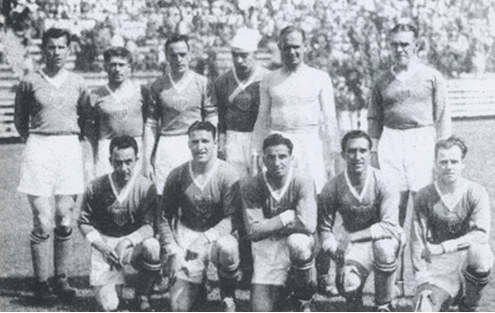 all-star team that included the legendary Archie Stark, who had not been selected for the U.S. team and scored a hat trick in the game. In the final match on May 5, the U.S. beat the Eastern Pennsylvania All-Stars, 2-0. It was, as Connell explained, a “compromise” team. The sixth player, Aldo “Buff” Donelli, had been born in Morgan, a town in western Pennsylvania not far from Pittsburgh. While attending Duquesne University, Donelli played for the school’s American football team on Saturdays and in amateur soccer leagues on Sundays. In 1929, the 5ft 7in, 170lb center forward was on the Heidelberg FC team that won the National Amateur Cup, scoring five goals in the 9-0 win over the First Germans of Newark. Donelli was playing for the Curry Silver Tops in Pittsburgh when he received an invitation to tryout for the U.S. team. He scored a hat trick in the first tryout game, the 8-0 win over the Pennsylvania League All-Stars. Also on the 1934 squad were veterans of the 1930 team including Jimmy Gallagher (Cleveland Slavia), who had played for Philadelphia’s Fleisher Yarn in 1924-25, Thomas Florie (Pawtucket Rangers), and George Moorehouse and Billy Gonsalves (St. Louis Stix, Baer & Fuller). Two other players came from St. Louis Stix, Baer & Fuller (winners of the US Challenge Cup in 1933, 1934, and again in 1935), three more from Pawtucket Rangers (runners up in 1934), and one each from the Chicago Wieboldt Wonder Bolts, Baltimore Canton, Brooklyn Celtic, and the New York Americans. 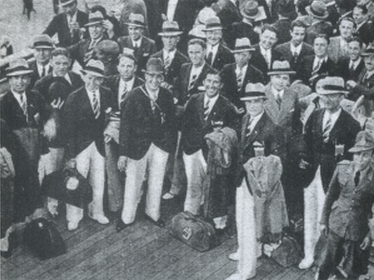 The U.S. team departs aboard the Italian Line steamship Roma on May 5, 1934. Just as the game of soccer had been hard hit by the Depression, so too had the United States Football Association. Because of its uncertain financial status, the U.S.F.A. was late in submitting its application to compete in the 1934 World Cup. FIFA accepted the application with the stipulation that the US would have to play a one-off qualification game against the winner of the North American qualifying round of games, Mexico, who had defeated Cuba in three straight qualification games, outscoring their opponents 12 goals to 3. While Mexico had played only 14 official and unofficial international matches at this point, the U.S. itself had played only 15 since its first official international in 1916 with none played from 1931 through 1933. Donelli started the team’s first scrimmage game in Rome on the reserves side. At the half, the reserves, filled out with three Roma players, were leading the first team, 1-0, thanks to goal from Donelli. In the second half, Donelli was moved to the first team and ended up scoring the winning goal. Nevertheless, Donelli was unknown to the professional players on the team and he had the impression they were “disdainful of the amateur from the coal fields.” He said later, “There was a clique among the New York and St. Louis players and they wanted to keep me out of the lineup.” Recognizing Donelli’s undeniable talent for goals, Billy Gonsalves, the “Babe Ruth of American Soccer,” who described the center forward as being like “a little truck,” told Schroeder he wouldn’t play if Donelli wasn’t on the starting roster against Mexico. Seven minutes later, Manuel Alonso equalized for Mexico, but the scoreline would not remain level for long. In the 32nd minute, left wing William McClean connected with Donelli, who fired a low shot to put the U.S. up 2-1. Fourteen minutes into the second half Mexico’s Lorenzo Camarena was ejected for trying to pull Donelli down as he advanced on goal. Now with a one-man advantage, the U.S. and Donelli pressed for control of the match. In the 74th minute Donelli received a pass from inside right Werner Nilsen and broke away from the two defenders marking him before firing a blast on the run that froze Mexico goalkeeper Rafael Navarro to make the score 3-1. While Dionisio Mejía scored for Mexico to make it 3-2 a minute later, Donelli added to his hat trick in the 87th minute with a surprise shot between two defenders and the match ended with the U.S. winning, 4-2. The U.S. would not defeat Mexico again for another 46 years, going winless for 26 games until the 2-1 victory in a World Cup Qualifying match on November 23, 1980 in Fort Lauderdale, Florida. Three days after the playoff game against Mexico, the U.S. faced host country Italy on May 27 in the first round of the 1934 World Cup, which was being played in a straight knockout format for the first time (group play would return for the 1950 World Cup). Donelli scored the lone American goal in the 7-1 loss to the eventual champions. Despite receiving offers to play in Europe professionally, Donelli returned home with his team on June 24 after the US played a series of exhibition games — two in Italy and four in Germany for a 3-1-2 record — never again making an appearance for the national team before embarking on a long coaching career in college and professional American football. During the Second World War, he returned to soccer, playing with the Morgan Strasser team that reached the National Challenge Cup final in 1943 and 1944, losing each time to Brooklyn Hispano. A great account of an interesting chapter in American soccer history. Donelli was a meteor: A short career, but brilliant while he lasted. 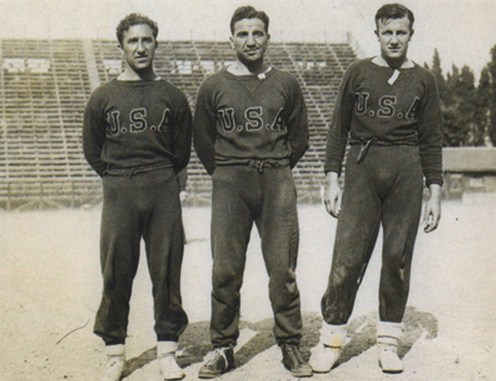 During the match against Mexico, U.S. wore blu-navy shirts but in the next game against Italy someone suggests it wore red ones not to clashing with pale-blue of Italy as reported here http://www.historicalkits.co.uk/. Is it true?